The first tip I have for visiting Sri Lanka is simple – go to Sri Lanka! Sri Lanka has ancient temples, soaring mountains, thundering waterfalls, safari parks, sandy beaches, and a stunning colonial city. It is a hassle-free destination with friendly people and delicious, healthy food. Basically, we should all be in Sri Lanka right now. I spent three weeks traveling around the island in December 2017/January 2018. Here are a few things I learned from my experience that may be useful if you make a journey to the island. A travel agent in Colombo kept referring to the train ride from Nuwara Eliya to Ella as the “the most beautiful train ride in the world” with an exaggerated emphasis for comedic effect. Once we got onboard and started traveling past tea plantations, colorful highland villages, and towering waterfalls, it was easy to see that there was some truth in his over-the-top sales pitch. And that may not be the most impressive train ride in Sri Lanka! The coastal line from Galle to Colombo passes sandy beaches, rickety fishing villages, and offers constant views of sapphire sea. Maybe the best part of any train journey isn’t the scenery, but the snacks you can buy on board. Vendors pass through the cars selling roti, deep fried garbanzo bean cakes, and samosas. There is no need to buy food for the journey – hop on board and great food will come to you! For more information on Sri Lankan trains, check out Seat61.com. We may not have visited Mihintale and other off the beaten path places without a car and driver. As a budget traveler at heart, it really pains me to admit this, much less recommend it, but we splurged on a car and driver for a portion of the trip and it greatly enhanced our experience. The ancient cities of Anuradhapura, Polonnuwara, Sigiriya and Dambulla are connected by a network of buses, but they are slow and crowded. Having a driver for this portion took out all the stress of travel and allowed us to see much more in a shorter period of time. Each morning our driver would show up early, drive us to the ruins, take us to lunch, then drive us to the next city in the afternoon. We saved about four days of travel by doing this and were able to see much more of the country as a result. In addition, we got to eat at several out of the way restaurants and cafes we’d have never found without the local knowledge of the driver and freedom of a car. Most travelers skip over Colombo because it lacks traditional tourist sites and is a sprawling, sweltering, chaotic mess. I’d recommend staying a day or two and exploring the city. It has a few great parks, especially Galle Face Green, and can be a fun place to practice your photography. They have 90% excellent ratings on Trip Advisor for a reason. 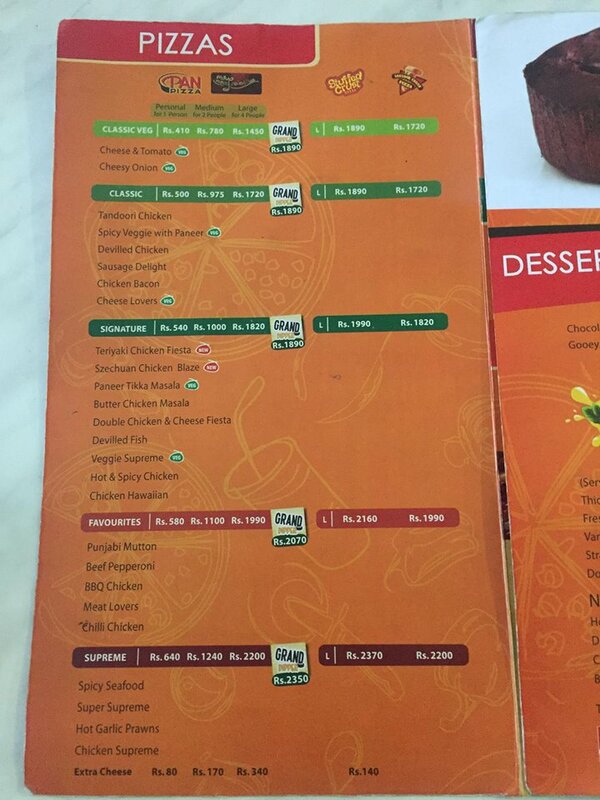 Pizza Hut in Sri Lanka has some interesting pizzas, from Tandori Chicken to Punjabi Mutton to Butter Chicken Masala. Sri Lanka doesn’t have a strong street food or restaurant culture like other Asian countries, and I didn’t really appreciate this until we wandered around the town of Anuradhapura looking for dinner and realized that Pizza Hut – yes the American pizza chain – was the happening spot in town! Especially in some of the smaller towns like Annurahapura, Polonnuwara, and Nuwara Eliya, there is a dearth of tourist oriented restaurants. Having said that, many of the guesthouses in those towns offer excellent meals, but it usually needs be booked in advance and they don’t stay open very late. Sri Lankan rice and curry is one of my all-time favorite meals, and you can’t beat the roadside rotis, but you’ll need Pizza Hut to survive at times. Sri Lanka has two different monsoons and weather can vary from one side of the small island to the other. We had some days of heavy rain in the north in December, but dry and sunny weather in the south. I’d recommend checking out this link on weather when you start planning your trip. 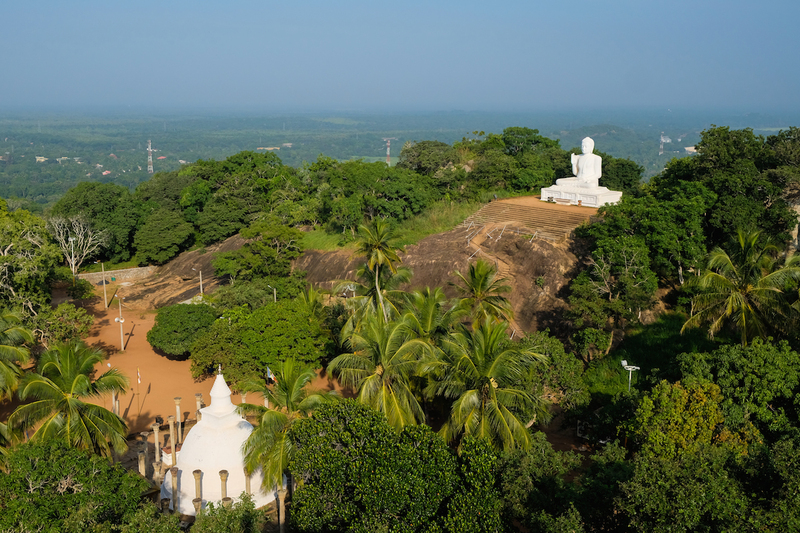 Anuradhapura without the pilgrims or religious ceremonies is worth a visit. The ruins and restored temples are impressive. However, if you can visit during a time when it is busy with locals the experience will be improved 10 fold. We saw several tourists denied entry to temples because they were wearing shorts. You cannot get away with being underdressed at temples in Sri Lanka. At the very least, carry a sarong to put on if needed. Beyond that, Sri Lanka is a conservative country and to be a good citizen of the world, it is a good idea to dress appropriately. If you plan to climb Sigiriya, and you should despite the absurd $30 entry fee, get started as early as possible. It is a steep climb to the top and there is no shade on the summit. Even in the cool season, it was hot on the peak. For the uninitiated, Sigiriya is a plateau with sheer cliffs that served as an ancient fortress. It was difficult climbing it on rickety ladders and steps carved into the rocks. I have not idea how they climbed it in the old days. I imagine more than a few unfortunate people fell to their demise. 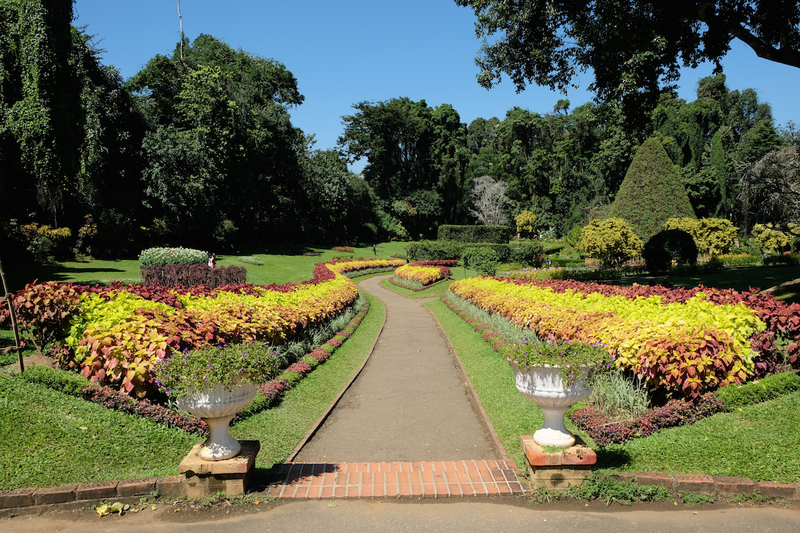 One of the unexpected highlights of our trip were the botanical gardens in Kandy. I sort of scoffed at the idea of botanical gardens, but once inside we found a massive, sprawling park with beautiful trees, picnicking families and pleasant tea shops. You have to try this place – great coffee and tea, inventive dishes like a shrimp/bacon/avocado wrap, and perhaps the best milkshakes in Asia. The cafe is in a relatively quiet street away form the main tourist area. Service is very friendly and everything is cooked to order in the tiny kitchen. Fishermen repairing their nets after a morning of fishing. Women headed to work in Galle Fort. I woke up around sunrise and took a stroll through the beautiful and surprisingly quiet streets of colonial Galle Fort. Nothing was open and no one was around, which was bad because I wanted to take some street photos and I desperately needed coffee. But around 7:30am, the streets became a river of school kids, women in saris, and men in suits. Combine this with the soft morning light and gorgeous architecture, and it was a visual feast. Do you have any other tips for visiting Sri Lanka? I must admit, Sri Lanka was never a destination on my list until I started reading Peta & Ben’s blog over at Empty Nesters on a Green Global Trek, who currently call Sri Lanka home. It looks absolutely beautiful! Thank you for once again reminding me that this is a part of the world I need to investigate! Peta and Ben’s blog certainly inspired me to visit. I was expecting the people to be nice and the scenery to be wonderful, but it exceeded my lofty expectations! Make sure and go – it is a great place. Sri Lanka jumped onto my list due to a few other travel bloggers, and your post just adds to the justifications for a trip there at some point soon. I found your map with methods of transportation particularly helpful – thanks! I am glad you found that map useful. I should have mentioned too that our driver was a really nice and fun guy. It is a very photogenic country! There is so much color, and the light at that time of year was clean and bright. Thank you for the comments and kind words. Thanks for sharing Sir Lanka. Enjoyed all your pictures and stories. Jeff, Sri Lanka is most definitely on my travel wish list. Your tips and map will come very handy so I will keep this post for future reference. How long should I aim to spend there to see some of the main highlights? Good question on length of stay. We did 23 days, and I think 3 week is about right. With three weeks you can see the temples of the north, explore the mountains, visit a safari park and then relax on the beach at the end. However, I think the northern ruins and temples are skippable if you have just come from India or SE Asia and have some temple fatigue. Bypassing the north and focusing on the south, I think 12-14 days is about right. On our list Jeff and I am grateful to have your map and specific tips. I think I will need to train up for heat and humidity for future trips to Asia. perhaps some extended time in a sauna would serve me well. Your post initiated a great dinner conversation about our next big travel destination, with me rooting for Sri Lanka! Thanks Jeff. Would you recommend it over india (have not been there)? Did you find the driver through a place you were staying? Love the map; how did you create it? India and Sri Lanka are the same but very much different. India, especially in the north, is very chaotic, crowded and dirty, but also very colorful, fun and exciting. The Taj Mahal, forts of Rajasthan, and Varanasi are incomparable.I love India. But, it also comes with a lot of hassles. Sri Lanka is totally hassle free. There is a lot of nature to explore and has a slower overall pace, but the temples and ruins in the north, while impressive, don’t compare to those in India. I’d say do both eventually – if you are looking for green, nature and a slow pace, do Sri Lanka; If you are ready for an adventure, do India. We found the driver at a random travel agency by the Fort Train Station. I imagine every guest house can arrange it. Here is a link I found that may be useful. https://srilankacaranddriverhire.com Also, if you decide to go I have the number of our driver and you can call him. Thanks so much for all this info Jeff. I agree, I need to visit both countries! Another Sri Lanka post to entice me to go there! Very sneaky! And here I thought I was safe from enticement and you go and do it again! You make it sound so appealing. Love that shot of the men watching the sunset. If Don doesn’t want to return to India, maybe he’d go to Sri Lanka? It is hassle free, slower, greener and easier than India, but you still have the lovely people and great food. I’m sure you’d enjoy it! Sri Lanka among my favorite travel destinations. I’ve been there twice, but there are still so many parts of this island that I have yet to explore. A lot of people I met on my second trip told me to go to Jaffna next time I come since this northern part of Sri Lanka which was ravaged by prolonged civil war has now become a peaceful place once again. 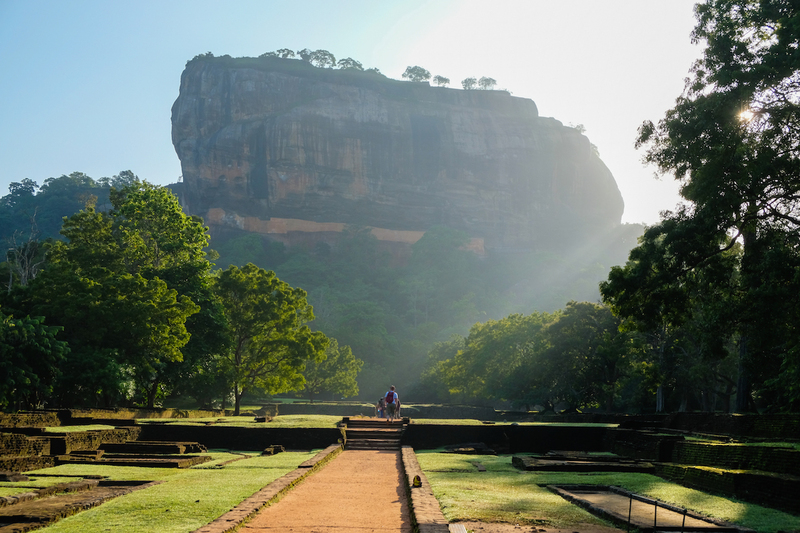 I really love your photo of Sigiriya in the morning with that soft light — on both trips I went there in the afternoon. Like you, most of the time I also hired a driver and a car to get around easily exactly for the same reasons that you mentioned. On our way back from Sigiriya to Kandy we stopped by a modest restaurant to have some delicious local snacks. James and I were the only foreigners there, and had we not got our own driver we would have missed this place altogether. I was resistant to the car/driver idea at first, but it is really the only way to do it unless you are going solo and have more time than money. We stopped at some famous places with all the other tourists, but we had the same experience of eating at some roadside stalls with no foreigners. I feel like in many ways I saw what I wanted, although I have heard Jaffna is nice. I will go back again because the people are so nice and the rice and curry is amazing. Always fun to read others perceptions and experiences in Sri Lanka and I do so love your photographs which capture it so well. I have to mention though that we have never eaten at PIzza Hut haha, as we have always found plenty of restaurants which cater both to locals (curries and rotis) and of course to tourists as well (but these restaurants are naturally in predominantly tourist areas). Also the fruit found in the markets and small stalls everywhere throughout Sri Lanka, make for great snacks and there is a wonderfully good quality of mangoes, papayas, pineapples, coconuts, watermelon etc. Good collection of tips for sure! I love seeing posts about Alaska or Bangkok for the same reason. When you live in a place it is always interesting to see what other think. Come to think of it, we ate at Pizza Hut in Nuwara Elilya on Christmas when everything was closed. But I stand by my statement that the most happening place in Anuradhapura town, at least the side we were on, is Pizza Hut. Maybe I need to open a hip cafe/restaurant/bar there? The roadside curries and rotis were amazing, and yes, those snacks and fruits in the markets are very fresh. Fantastic post– great photos and information, Jeff. I especially love the photo in Colombo and the contrast of cultures in “dress appropriately”! I followed that couple for a couple of blocks trying to get that photo – all the women in saris were coming home from work and the juxtaposition was too funny. Thanks for the comments! Sri Lanka has become my next destination of interest. I am thinking of visiting next December so I’ve started my research early (ha ha). How much did it cost for the driver and how did you go about finding and organising the driver? We found the driver through a travel agency (whose name I can’t find/recall). However, I think about any hotel/guesthouse can arrange it. We paid about $45 a day and that included gas, driver accommodations, and his food. You might try this link for a driver https://srilankacaranddriverhire.com Also, if you decide to go I have the phone number of our driver I can send you. Happy planning! Looks like a place I’d love to visit. Great advice! But you wouldn’t want to drive an RV on those roads. This is so great and inspiring! Thank you for sharing! Thank you Kelsey. I appreciate the comments. Now, Sri Lanka looks absolutely beautiful! Some great tips there!! Thanks Jamie. It is an incredible place – if you haven’t been you should go! I am planning a trip soon and have been enjoying reading about your experience of Sri Lanka. Thank you. I am glad you liked it. Where are you planning to go? Thank you for all the tips! Sri Lanka is definitely on my bucket list after reading this and seeing your pictures! I can’t recommend Sri Lanka enough – it is one of the top destinations in the world if you like hiking and beaches, and are interested in ancient temples. Great Post, loved your words and travel tips. Try and go soon! It is getting more popular by the day, but right now you can still find some untouristy spots. Jeff, a fantastic post. 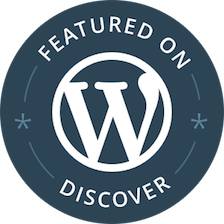 Your blog has piqued my interest. I am sure going to SriLanka soon. Excellent photos too. Gives a vibe of the areas you have traveled in and through. Thank you. Sri Lanka is one of my favorite places and I think a definite must do before it gets busy with tourists. Let me know if you need any further info or advice before you go. I really don’t remember – that makes me a bad travel writer, I know. I *think* it was about $40 per day and that included the gas, car, driver and his food and lodging. It is really the only way to really see the north I think. Just splurge if needed, and save the public transport for the south. Thanks, I’ll look into it when we’re there, but it sounds like a great idea. It is. Are you thinking of going? Sri Lanka sounds amazing and your photography really captures the essence of the place; very inspiring!